If you think of zombie movies, there’s a better-than-good chance that the name George Romero might crop up at the back of your tasty, tasty brains. However, it appears the father of the zombie genre has had a tough time finding financial backing for his latest undead flick - and Brad Pitt and The Walking Dead are to blame. The landscape of the industry has changed since Romero’s 1968 seminal classic Night of the Living Dead, and Romero just wants to make a smart, atmospheric movie that just happen to feature zombies. Is that too much to ask? 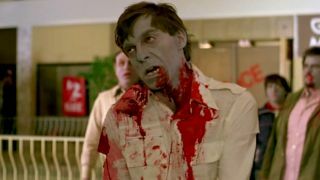 Apparently so: when trying to pitch a new film, the producers just don’t see it that way, “It had to be a zombie film with just zombies wreaking havoc. That’s not what I’m about”. But what does Brad Pitt have to do with Romero’s struggle? Well, for Romero, World War Z marked a massive watershed moment for the future of his franchise and the zombie genre as a whole. “The moment you mention the word ‘zombie,’ it’s got to be, ‘Hey, Brad Pitt paid $400 million to do that.’” So, there you have it: Hollywood’s favourite pretty boy actor is indirectly responsible for Romero not making another movie. Gee, thanks a lot, Brad. There is still hope for George Romero to make a triumphant return to the silver screen however, as he says, “My son has been trying to raise money for a Living Dead prequel”. The Walking Deads and World War Zs of the world may be raking in the flesh-rotting big bucks, but there's still a possibility, however remote, that we may yet live to see another Romero classic.